This document provides a high level overview of the Google Analytics Embed API. 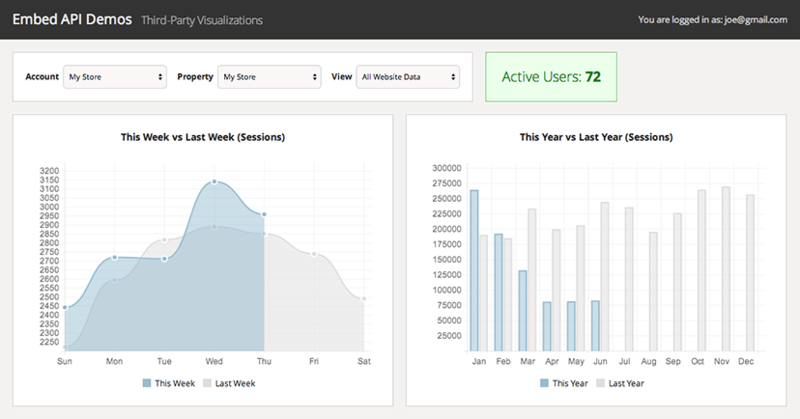 A dashboard built with the Embed API. A one-click Google Analytics sign-in button, so you don't have to handle authorization yourself. A built-in view (profile) selector, so you can easily compare data from multiple views at the same time. Integration with Google charts to give you the same visualizations you see in the Google Analytics website. Full access to run your own queries, allowing you to use third-party visualization tools like d3.js and chart.js. The ability to build and package your own components, so you can easily reuse or share them with others. The fastest way to get started with the Embed API is to read the developer guide, which walks you through the complete process of building a simple dashboard from scratch. You should also take a look at the Embed API demo site, which shows live examples of dashboards built using the Embed API. Once you understand how the API works, dive deeper by familiarizing yourself with the API reference. If you'd like to build your own components, check out the creating custom components developer guide. You can also find sample components on Github. Last updated October 17, 2018.